Your chief pilot, Scott Nicol, is also the owner of Roping The Wind Hot Air Balloon Company. Scott has been flying balloons since 1991 and has acquired over 3000 hours of flight time in balloons. He holds commercial balloon pilot licenses in the United States and Canada. He learned how to fly balloons in the Chandler, Arizona area, an area considered to be 'populated' by balloonists standards. This gave Scott the ability to truly learn how to maneuver balloons to 'postage stamp' size landing spots in the urban area. Soon, after gaining his private pilot certificate, Scott started experimenting with the local wind patterns of the far east valley... primarily Apache Junction and then Queen Creek. The Superstition Mountains have always intrigued Scott and he has explored the mountains by foot and has hiked many miles of trails in the Superstition Wilderness. So, it was fitting that he wanted to fly balloons near this legendary and mysterious mountain range. Over the next few years of his early flying days, Scott began doing what he calls 'adventure flights'. Scott loves the state of Arizona and the many scenic and beautiful locations around the state. Unfortunately, many would consider these areas to be challenging for balloon flight due to limited options for landing sites and few roads. But, that is why he calls it 'adventure' flying! Scott has flown in many remote locations around Arizona as well as several of the small towns in the northern Arizona mountain locations as well as on the deserts of the southwestern part of the state. Scott has logged many hours of flight time along the Mogollon Rim in east central Arizona... having logged flights from Payson to as far east as Springerville. He has seen much of the Mogollon Rim from the basket of a hot air balloon. 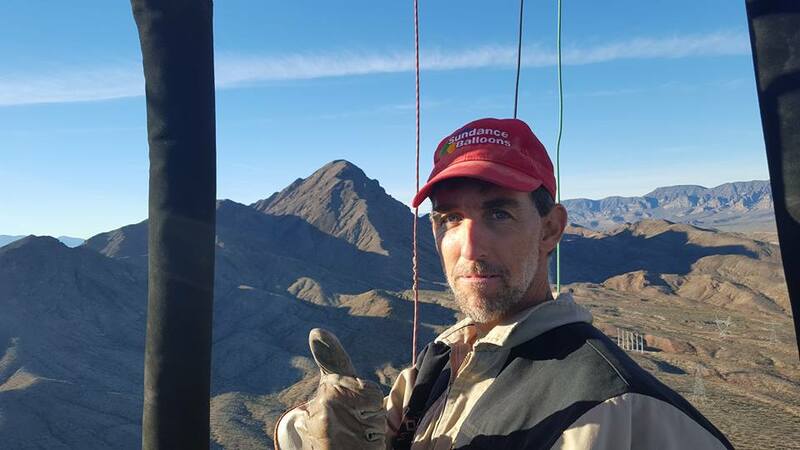 In addition to flying over mountain peaks and the small valleys in-between, Scott has also made several long distance flights in balloons around Arizona. His longest was a flight from Queen Creek to the Altar Valley (north of Sasabe, AZ) on December 28, 2003. A flight of nearly 100 miles. Each year Scott tries to make a few flights to further his personal ballooning records. Competition is another aspect of ballooning that Scott enjoys. Having competed all his life in other sports, he is a natural born competitor. So, when he found out about competitive ballooning contests, he jumped right in! Scott is one of only a few Arizona pilots that has been ranked in the National Ranking System. He ranked high in the now defunct NABA (North American Balloon Assocation) national rankings for 4 years straight, reaching as high as 20th in year end standings (and as high as 8th at one point in the season). He has also been a qualifier to the NABA national championships, having competed in the 2002 NABA National Championships in Waco, Texas. Scott is a member of Top Gun, a NABA sanctioned competition club in New Mexico. He placed in the top 10 in year end rankings in 2002 and 2003. He was named the 2002 Top Gun Rookie of the Year. Few pilots are dedicated competition balloonist. Those who are, tend to be more skilled in their profession. 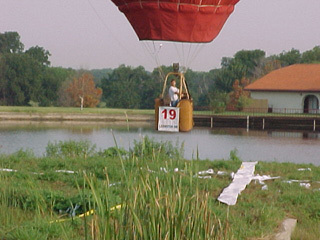 Competition requires a pilot to 'steer' a balloon to a set number of targets displayed on the ground. A balloon cannot be steered, so a pilot must find a launch site and wind direction that will provide the necessary means to get to a target. A competition pilot has a keen sense of the limitations of his balloon system and tends to 'see' very slight changes in the wind that others often times cannot perceive. In 1996, Scott acquired his commercial pilot certificate and after logging several hundred hours of flight time, went on to establish his new balloon company.... Roping The Wind Hot Air Balloon Company. Scott has always enjoyed introducing new faces to the sport and allowing others to experience this unique form of flight with him. He named his company after his first balloon "Roping The Wind". (this was also a quote out of an old Chris Ledoux song!). He also felt the name fit the western image that his company portrays. Scott has always been a fan of the western lifestyle and enjoys listening to old cowboy and western songs and reading of the history of the old west. Today, almost three decades later, Scott continues to introduce new people to the sport of ballooning through his company. He has flown hundreds of happy passengers. He has flown most manufacturers or balloons, including special shapes. He has flown single one man balloons to large ridge balloons over 300,000 cubic feet. When your pilot truly enjoys what he does and is enjoying every minute of the flight with you, you can be assured the best possible flight available! Scott is often times the last balloon in the air during balloon rallies and festivals! He is usually the one that can be seen 'way up there' or 'way out there'! In addition to running the company, Scott continues to find time to gather his Adventure Flight Team (a dedicated group of friends and family) and head out for more challenging flying locations and continues to hone his skills through competitive flying events. Give Roping The Wind Hot Air Balloon Company a call and climb aboard with your Captain... Scott Nicol, on the adventure of a lifetime!